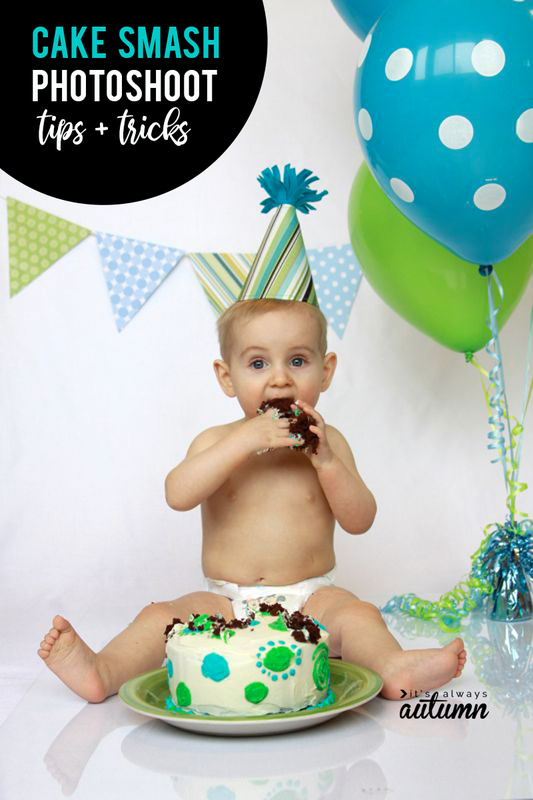 DIY Cake Smash photoshoot: get awesome photos of baby’s first birthday at home! 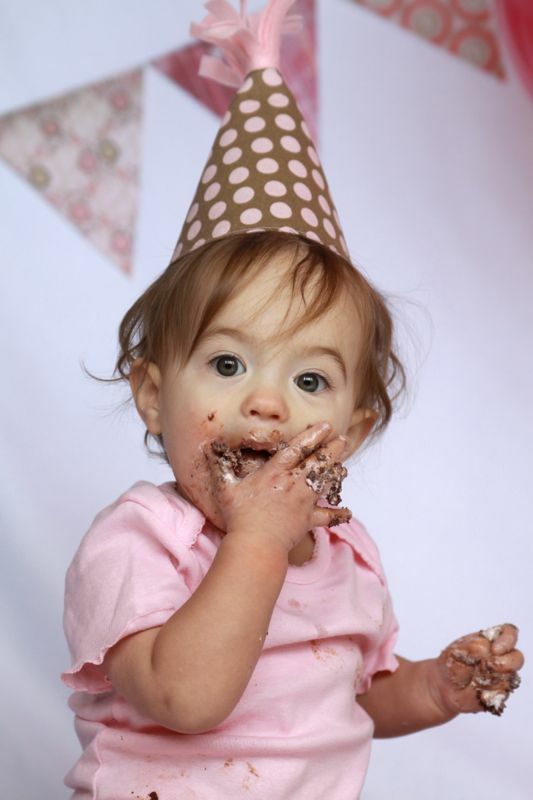 In today’s post: Get great photos of your baby’s first birthday with a DIY cake smash photoshoot! 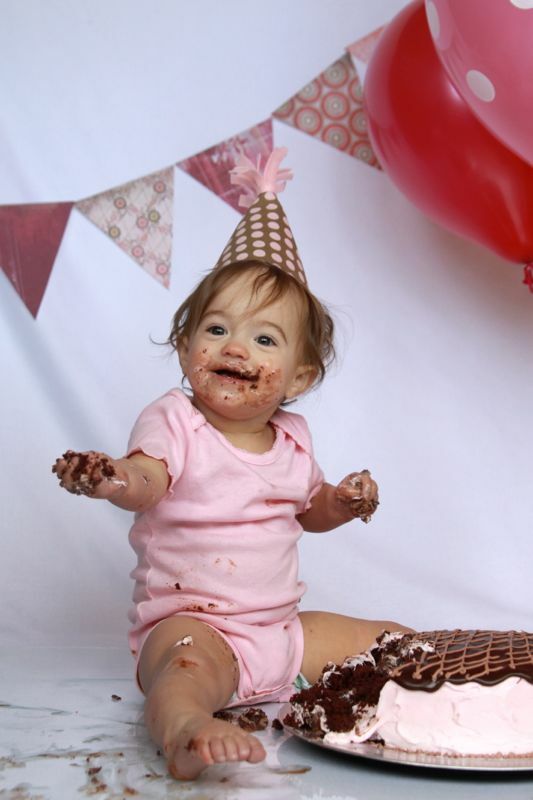 A cake smash photo shoot is an incredibly fun way to mark your baby’s first birthday. 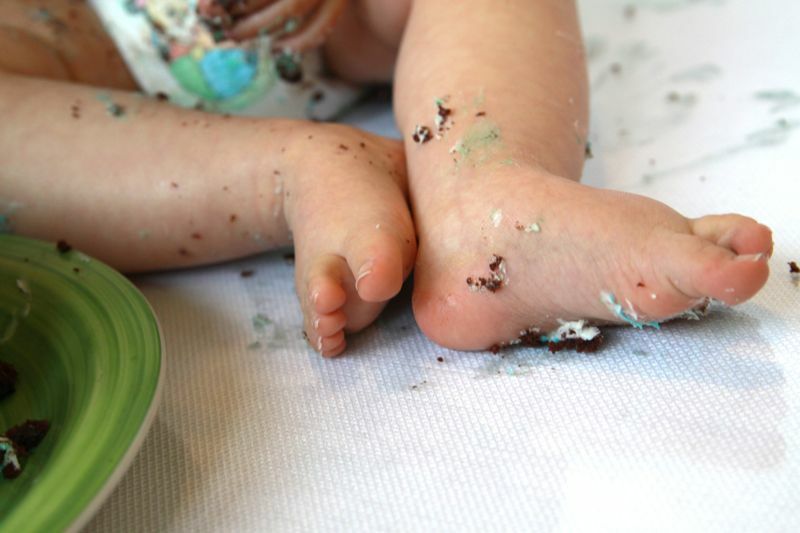 It’s fun to do a cake smash BEFORE the birthday party so you can focus on getting good pictures of your baby enjoying his first bite of cake without worrying about neglecting your guests. And you can let him make all the mess he wants and then get it all cleaned up before the party takes place. 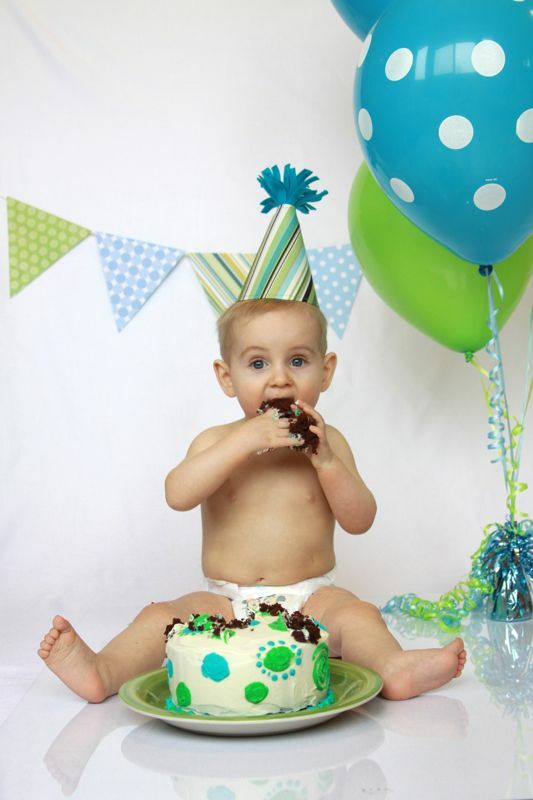 Sure, he can have more cake at the party, but if you know you already have great photos, you won’t be so worried about getting the perfect shot during the party. If you look closely, you can also see the piece of glass and the spot where the floor meets the backdrop board. Using glass or plexiglass on the floor is not necessary; however it helps to anchor the tablecloth and makes sure it doesn’t wrinkle up as the child sitting on it moves around. It also gives a nice little reflective effect. My piece of glass was recently destroyed by a child randomly throwing objects around my garage (don’t ask), so I’ve beeen thinking of other options to use for this, and I’m thinking clear vinyl would serve the same purpose (as long as you use something heavy on the corners to hold it in place). Clear vinyl is very cheap – you can get it in the fabric section of Walmart. Whatever you decide to use, the most important part is using a solid colored piece of fabric that’s large enough to drape down behind the baby and also cover the floor under the baby – and do everything you can to smooth out wrinkles. 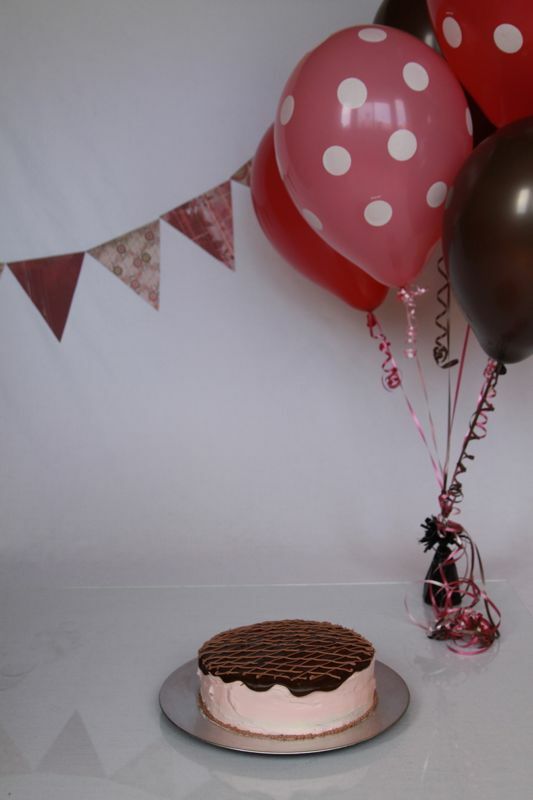 Props Decide on a color scheme for your cake smash photoshoot, and then gather your props. Balloons look fantastic in the background of photos, and are easy to find in just about any color. Cut triangles from scrapbook paper and string them together to make a banner (or just put masking tape on the back of each one and tape them directly to your background). A birthday hat (buy one that matches or make one from coordinating fabric) completes the scene. Cake You could buy a cake from a bakery, but it’s fairly simple to make your own in round pans and spend a little time decorating it. 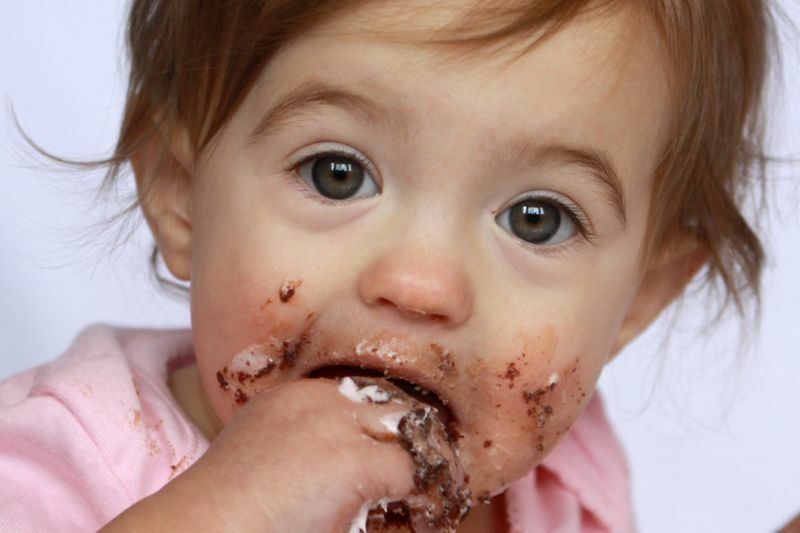 Two cake tips: First, make a chocolate cake! 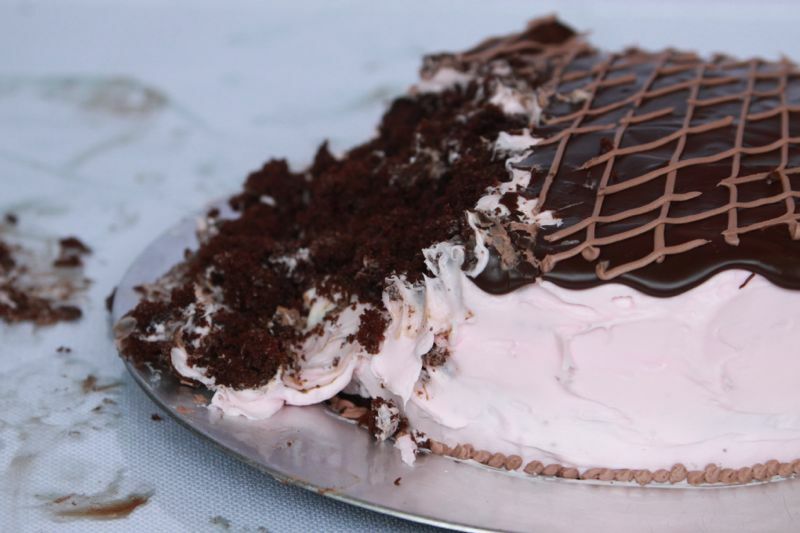 The dark colored cake shows up much better in photographs and looks much cuter as it gets strewn around. Second, buy at least 3 cans of frosting, so you have plenty to tint different colors. 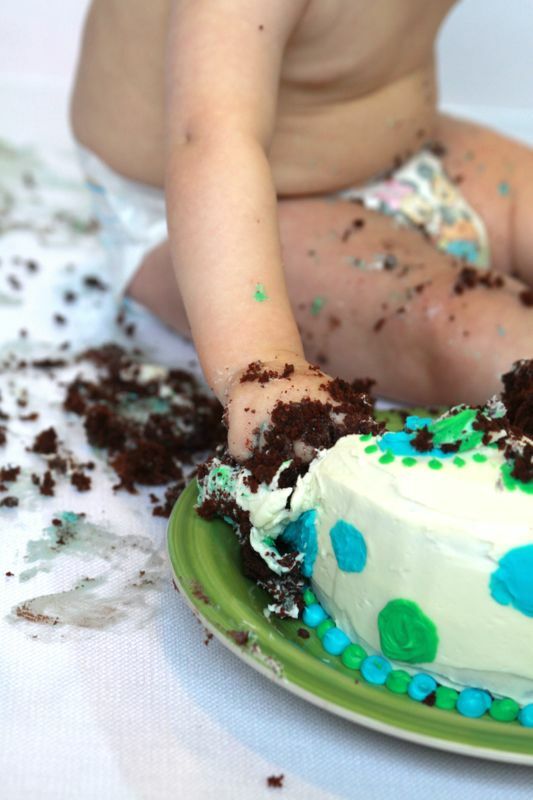 I normally make frosting, not buy it, but for a cake smash photoshoot I’m more concerned about looks than taste, and store-bought frosting cuts down on prep time. Once your scene is set, get out your camera a take a few test shots. I recommend switching to portrait setting on your camera, or if you have some experience shooting on other modes choose AV and pick a fairly low aperture number (maybe 2.8 or 3.2). Be sure to set up with baby facing a large window during midday when there’s plenty of light coming in (but not when you can see a bright window-shaped patch on the floor in front of your window – more on window light). You will not be happy with your photoshoot if there isn’t enough light and you have to use your flash. Then put baby down and start shooting! Since the baby will be on the floor, you’ll need to be on the floor as well so you can shoot from about her eye level. 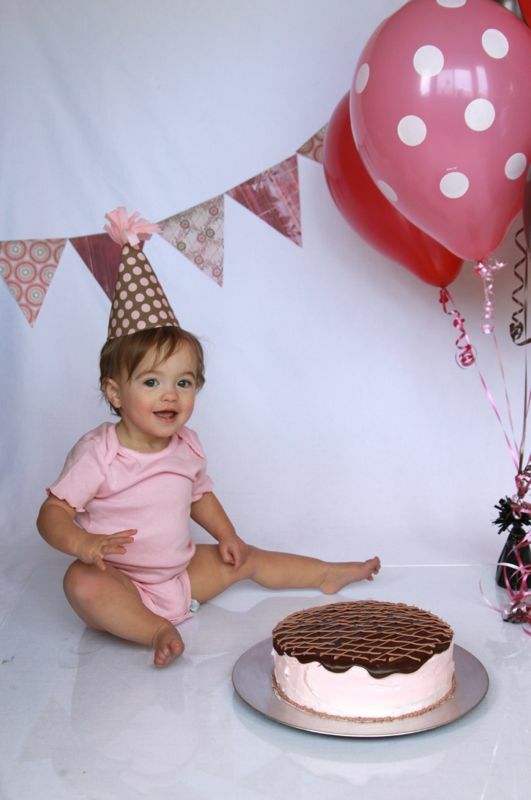 Sit in front of her (probably just below the large window in the room that she’s facing) and snap away to get cake smash photos. Make sure to get a shot of the very first handful of cake and the very first bite. Good luck! 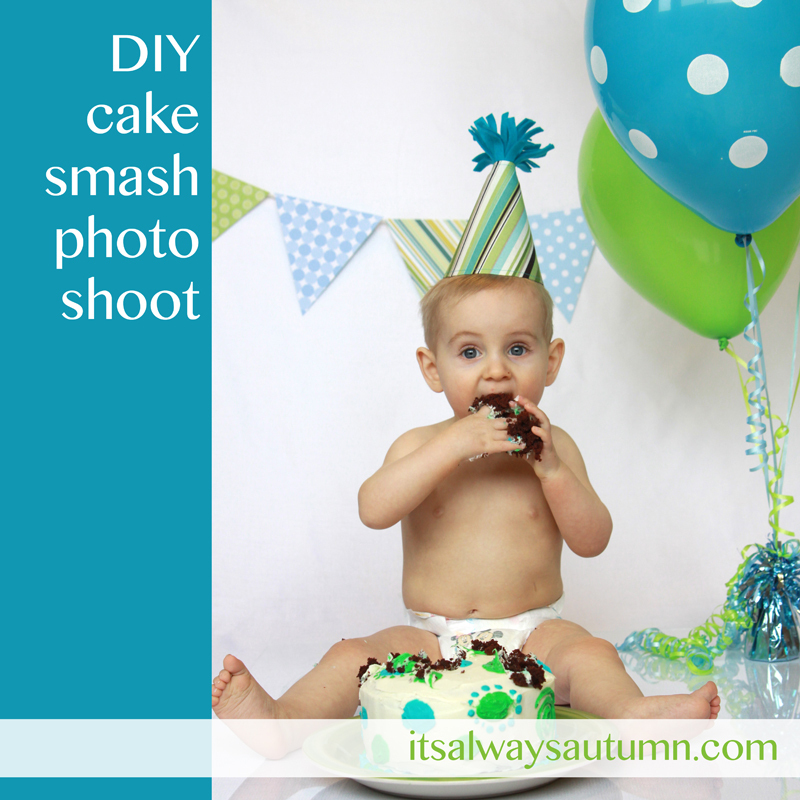 Hope you have a great time with your DIY cake smash photoshoot. And sorry to hear about the glass incident! Great step by step instructions! Great shots! How adorable! I am visiting you via the party at Somewhat Simple. I look forward to seeing you at My Dream Canvas. This looks like so much fun! Thanks for the tips. I especially like your background drop tablecloth idea. I’ve used blankets from time to time, but they never are quite long enough (at least those I’ve chosen). Thanks for the cute photo how-to. How fun and cute! Thanks for the great ideas. I’m heading over to my friends to try this on her birthday girl! 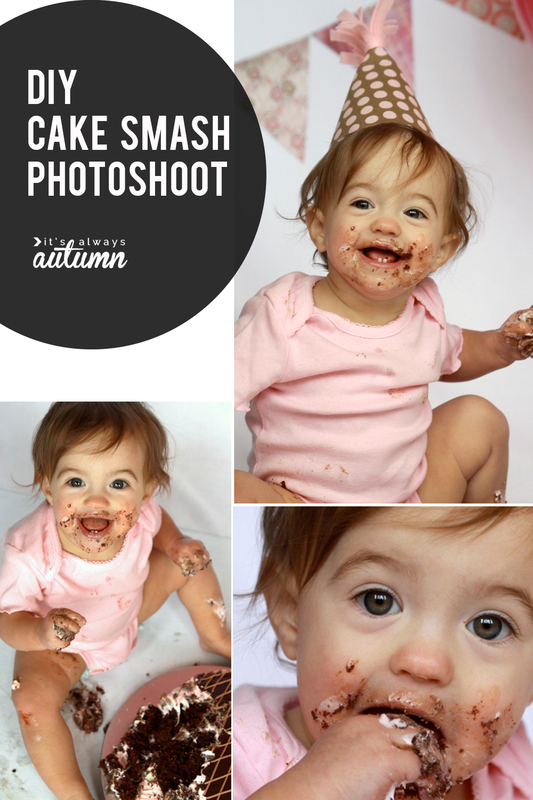 Thanks so much for this post, it helps me tremendously because I just booked my first cake smash session! I do have a question though, what size plexi glass do you use? I want to thank you for your suggestions. 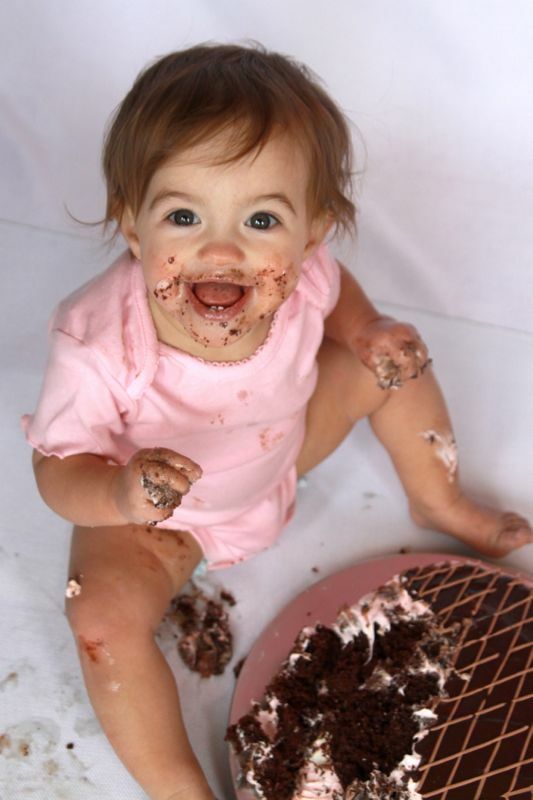 I just shot by grandson’s 1 yr old cake smash. 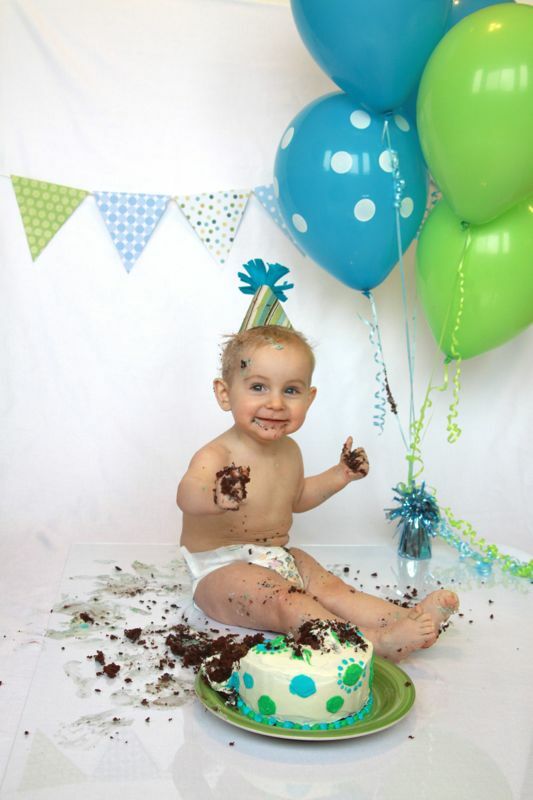 Although, at first we thought the cake smash wasn’t much of a success (because he didn’t get very messy), we ended up with a bunch of really cute pictures. The one thing (that you suggested and I didn’t do) that I will do differently next time, is to be sure to get the piece of plexiglass. We took the pictures outside on a cloth and it got wrinkled and tangled up from him crawling and standing on it. The pictures are still cute but I would have been happier if I had used the plexiglass. 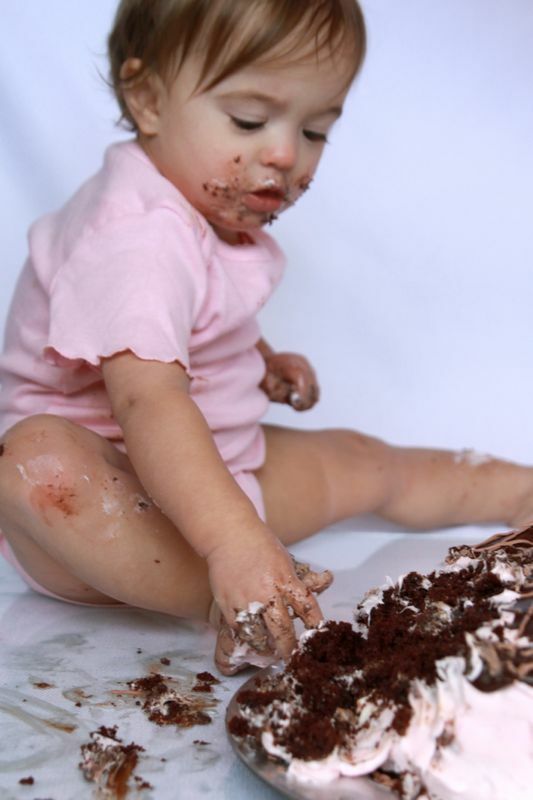 Great cake smash photos. They’re one of my favourite things to photograph. thanks! they’re sure a lot of fun. Awesome tips, thank you for sharing! I am really excited to do them myself!!! Los logros básicos ddan 5 gemas una vez cumplidoks y puedes ganar hasta 3.000 con el logro más difícil.